Why Did You Recommend Software that Doesn't Work? I sometimes get feedback that a recommendation I've made has failed, sometimes horribly, for someone. I'll discuss what I care about in backup solutions, and why my recommendation - or anyone's recommendation - might fail for some. 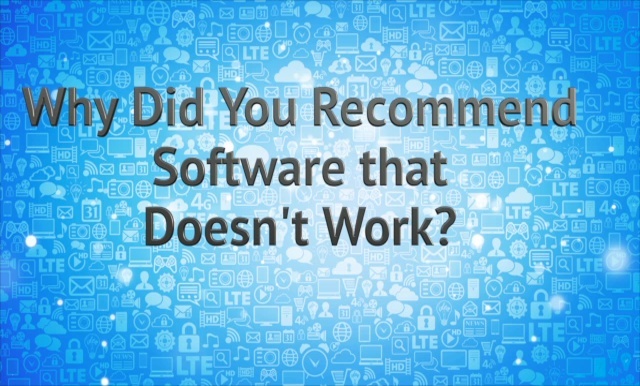 Continue Reading: Why Did You Recommend Software that Doesn't Work? How Do I Use an Open Wi-Fi Hotspot Safely? I've returned to the same coffee shop where I was a few months ago when I noticed that my email had been hijacked/hacked. This time, I'm using my phone, but the last time, when I noticed the hack, I was using my computer and doing email over an open-internet, free Wi-Fi network. Do you think that could be the source of the problem or just a coincidence? I'm still afraid to do email from here. It definitely could have been. Unfortunately, it's hard to say for sure, and it could have been something else unrelated. As we can't really diagnose the past, let's look ahead instead. It can be absolutely safe to send and receive email from a coffee shop, or any other location that provides unsecured or "open" Wi-Fi. In fact, I do it all the time. But you do have to follow some very important practices to ensure your safety. Continue Reading: How Do I Use an Open Wi-Fi Hotspot Safely? "That's why the cloud is dangerous." I think a lot of people feel that to varying degrees. … as well as a number of things you're already doing and have been doing for years. Continue Reading: Is the Cloud Dangerous? How do I Make Sure that Windows is Up-To-Date? Bad Fan or Bad HDD? Do you still dislike Window 7 backup? Recipient could't see Old Word document. Why? A screen shot is simply a picture of a computer screen – an exact copy in image form taken by the operating system or by a screen shot utility. Screen shots typically refer to the entire screen, hence the name; however, many utilities have the ability to restrict the image taken to only a region of the screen, a specific window on the screen, or, in some cases, the entire contents of a window, even if it's not completely displayed on the screen. Screen shots are typically saved as image files – .jpg and .png, for example. Some screen shot utilities also allow you to save in additional formats such as PDF, share to various online services, or even extract editable text from the region specified. See also: What's a screen shot and how do I make one? "For example, what business does Adobe PDF Reader have to be sending out information from your computer, especially if you've turned off the auto-update feature?" - Could be any number of reasons, including the document pulling external content. Really, if somebody has so little confidence in a company that they feel it necessary to block - or attempt to block, anyway - that company's product from making external connection, then it'd like to better to switch to a different company's products. "Now an outgoing firewall can be essential to minimize Windows 10 mining data from your hard drive and sending it out to the mother ship." - How do you know that ZoneAlarm - or whatever firewall you use - isn't "mining data from your hard drive and sending it out to the mother ship"? I can only assume that you trust developer of the firewall more than you trust Microsoft - but this is a stance that really doesn't make sense given that the firewall company will be subject to much less scrutiny than Microsoft: a company whose every move is put under the microscope by independent security researchers and regulators. The bottom line is that you shouldn't be using an application which your do not trust. Or an operating system. Our senior computer club in a retirement park has around 470 members who are becoming quite sophisticated users thanks to our continuing educational efforts and through our recommendations of articles and tips from sources such as Ask Leo!. If we want our members to learn about a specific topic, and Leo has addressed that subject, we usually just provide a link in our newsletter to the article so our members can read it themselves. I know many have subsequently subscribed to Ask Leo! for themselves. Occasionally, we have used Leo's articles as an idea source for our own adaptation more specific to our members' needs or our recommendations. In these instances we would always provide reference to Ask Leo! as the idea source for our discussion or refer to his article if it served a broader purpose. Thanks for helping our club grow in knowledge and understanding. Can I prevent my mail from being forwarded by others? Actually yes there is a way.. Send you email as an html email with the "letter image" being stored on your website or other specified image storage site then after an appropriate time delete the image! Note: This doesn't work with embedded image but true html email. Nope. The recipient can then just copy or take a screen shot, and then forward that on as desired. As a concrete example, I'll walk you through the process of setting up a mailing list using the mailing list provider I use, Aweber.